Paul had a vision in the night; a man of Macedonia was standing beseeching him and saying, "Come over to Macedonia and help us." (Acts 16:9). One of the fruits of Paul's response to his vision was the establishment of a Christian congregation in Thessalonica. Paul and Silas had come to this great harbor city from Philippi, where they had been beaten and cast into prison for spoiling the dubious money-making schemes of some Macedonian slave owners. As they came to Thessalonica, they met opposition again. Enraged Judaists, who were jealous of the converts won by the apostle, put a strange label on them: Men who turn the world upside down. This was an ugly charge by angry folk who didn't want their world changed. The light which had come out of Bethlehem was too bright for the kind of people who like the familiarity of darkness. Three weeks after their arrival, Paul and Silas were ushered out by their new converts before the lynch mob could find them. But their stay had been long enough. They left behind a new fellowship of believers, the Thessalonian Church. With such a short stay in the city, there had been little time to establish the converts in their new found faith. Would they stand firm in the message delivered them? Many of the converts were Gentiles and were unfamiliar with the traditions out of which the fulfilled hopes had come. They would have many questions. Who would show them the broad implications of the Way? Persecution had already begun in Thessalonica, even before Paul & Silas had left. Could the new believers stand in the face of it? The new church lived in the midst of strong pagan influences. How would the cults of Dionysus and Orpheus affect the Christian fellowship? Paul sent Timothy back to Thessalonica to see how the church was faring. Timothy returned with good news! The church lived. It had stood firm in its faith. With this information in his hands, Paul sent a letter to the fellowship. Silas and he had risked their lives to bring the message to Thessalonica. Their motive for coming had been to proclaim God's will and nothing more that that. They had been extremely careful not to be a burden to anyone and had worked for their own bread although they had every right to make "demands as apostles of Christ." As there were many wandering philosophers and teachers in the Greek world who lived on the gullibility of simple people, it is possible that the Judaist party in Thessalonica had accused them of being fakes who had duped the converts. Or Paul's motives may have been in suspicion due to his long absense from the fellowship in trying times. The Second Problem - Sexual Immorality - With the temples of Dionysus and Orpheus filled with "sacred prostitutes" and encouraging sexual orgies in the name of religion, there can be little question that the general moral tone of Thessalonica was at a low ebb. Add that many of the new converts had come into the church out of pagan traditions, and it is not strange that Paul reminds the new believers that there is a vast difference between the morals of a pagan and those of a Christian. The Third Problem - Why Work? - Early believers expected Christ's return to earth at any time. Jesus had said he would come again and the apostles had proclaimed the identical message everywhere they went. The believers persisted in looking for his reappearance today, tomorrow, or the next day. This "expectancy" created a problem in the Thessalonian church. The first letter implies that some believers were living a life of idleness and were creating a bad impression upon those outside the fellowship. We can conjecture that they were idle because they thought it foolish to work in view of Christ's imminent coming. What is implied in the first letter is declared openly in the second letter. To be sure, the Lord would come! But it was Paul's concern that while believers watched, they must also work, lest they fail to fulfill their responsibilities to God in this vineyard and in this kingdom. The Fourth Problem - Disrespect for Appointed Leaders - Since there were some Jewish converts and many Gentiles, it is reasonable to assume that the church would have its difficulties in determining who should lead. Paul makes a plea to the congregation to pay due regard to its designated leaders and strive for harmony within its own ranks. 2 Thessalonians - When Paul's first letter didn't have its desired effect, he followed it with a second one. Again, he commends the believers for their courage and steadfastness in the face of a growing persecution. He explains to the dedicated that though they are suffering now for their faith, this anguish will terminate when the Kingdom comes. And when it does, the wicked will be judged for the pain which they have inflicted upon God's righteous ones. The great apostasy (falling away) prophesied by Christ. The appearance of the man of lawlessness prophesied by Daniel. Throughout the Scriptures, both themes are noted: The apostacy will set disciple against disciple, goats claim to be sheep, people of faith will be led astray by the doctrines of demons. Meanwhile, "the man of lawlessness" will proclaim "himself to be God" and "shall speak astonishing things against the God of gods." When you see these things, Paul implies, then the Kingdom shall come. Turning his attention then to the idle, whose concern over times and seasons has turned them into "mere busybodies not doing any work", Paul commands a halt to this pilfering away of time and charges the church to take action to erase this disgrace in its midst. And with that, a benediction, and the letter ends. Banner and two quills - Among the many epistles written by Paul the apostle are two which were directed to the church at Thessalonica. First Quill - Paul's first letter to the Thessalonians. Quill is red - A letter which praises the church for its courage and steadfastness in the face of persecution. Figures laying stone blocks - A letter which admonishes believers to be steadfast in their work. Figure looking upward - A letter which gives specific counsel relative to the second coming of Christ. Grave - A letter which speaks to the question, "What will happen to those who have died before Christ returns?" 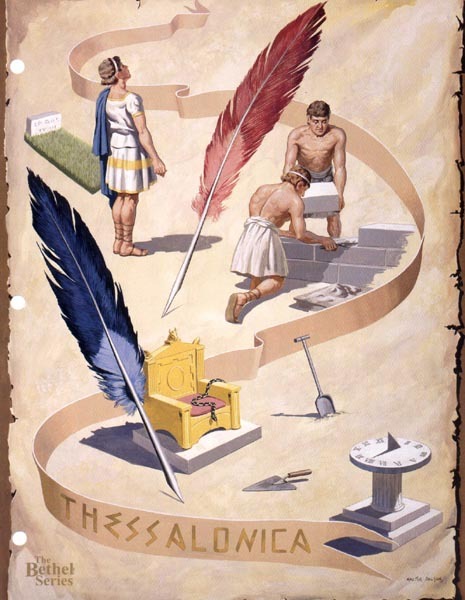 Second Quill - Paul's second letter to the Thessalonians. Quill is blue - Paul expresses a concern over misconceptions which have developed regarding Christ's second coming. Throne and serpent - Paul describes specific events and circumstances which will precede the second coming. Shovel and trowel - Paul rebukes members of the church who have abandoned their work on the pretense that Christians are permitted special privileges. Sundial - Paul denotes a concern over the church's undue emphasis upon "times and seasons."